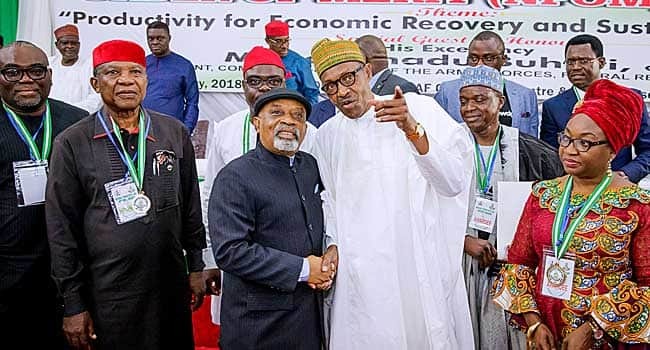 Following the wide declaration of support for the presidential candidate of Peoples Democratic Party, , by some groups, Chris Ngige, the minister of labour and employment, has opened up as to why influential elites are against the re-election of President Buhari. Speaking in Abuja, Ngige alleged that some influential Nigerians bent on the president's downfall are doing so because they are not getting money as they used to during the 16-year reign of PDP, The Punch reports. Legit.ng gathers that the minister, who laughed off the political values of PDP's vice presidential candidate, Peter Obi, also disclosed that Obi's selection will have no influence in the south-east election as people in the region are in full support of the president. He said: " They want the money that has been trapped by the Treasury Single Account to be pushed down again on the table for them to start taking. That one is no longer possible. Speaking on the selection of Peter Obi, Ngige, who was also a former governor of Anambra state, refuted the claim that the region automatically belonged to PDP, adding that what happened in 2015 when President Buhari was poorly voted for would not repeat itself. The minister attributed the outcome of the 2015 presidential election in the south-south to malfunctioning card readers, adding that such incident would not repeat itself. He said: “Yes the PDP has a vice presidential candidate from my zone (southeast) and I can tell you that it won’t be easy for them. Winning of election is all about calculation and strategic positioning and measured steps towards a direction. Meanwhile, Legit.ng previously reported that a coalition of aggrieved support groups numbering over 145 had dumped Atiku Abubakar and saying the latter had done well for the country and deserved a second term. Bello Osaretin, who was the leader of the coalition, said the Peoples Democratic Party would not return to power.